Open Europe: What impact will Cameron’s EU free movement changes actually have on the ground? I'm not sure about the so called fairness argument. "making sure that there's a link between what people put in and what they take out"
Is the social safety net an insurance or? If it is an insurance, how many get back what they paid in insurance? I.e. people have car-insurance but unless they cause an accident they might be paying for something they never use. The proposal will raise the effective tax on some low paid, it will make them chose to live in (even) cheaper accomodation. Maybe less money will be sent to the originating country or maybe less of wages will be spent in the UK economy. In the end, the practical effect is a tax-increase on some of the most vulnerable in the UK. Wasn't Portes part of Blair's clique which favoured greater immigration? Clever mis-direction here. The issue isn't decimal points. The issue is control of your own sovereign borders. Your response on your website states that the UK's plans would not necessitate any treaty changes, but the idea to restrict non-EU family members to accompany EU migrations DIRECTLY contravenes 2004/38/EC. Could you perhaps address this, or is your view of what constitutes "free movement" narrowing to accommodate UKIP too? Is there any danger that you might not use IMPACT when the better word is EFFECT? There will be no impact on Cameron's proposals. Because his rather stupid proposals will never be put into practice. The problem is NOT the Benefits. 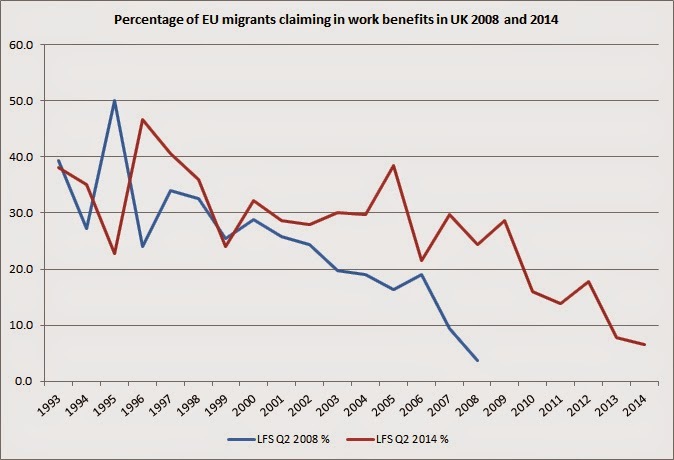 Benefits for Immigrants is a distraction to keep the British public's mind off the NUMBERS of EU Immigrants and the LOSS of the British to control their own borders. The EU pretends to be some sort of a "Country" - passport, flags, national Court, anthem etc. It is NOT a Country. It is a Customs Union/Trade Association run by jumped up clerks. Regardless of Germany's deep and historic desire to rule the nations of Europe - Britain will not play. But Britain must stand aside this time and let Germany at last, fulfil her destiny. When that leads to war, as it inevitably will - Britain must not go to the aid of the "rebels/victims" as before. The EU was a French bed - now it is firmly a German bed and the better for it - if one forgets about Democracy and other inconveniences. Go for it Germany - after the last failures - it is your time now. Cameron's proposals, even if put into effect and then not declared contrary to EU law and repealed, will have no significant effect on the rate of immigration from the rest of the EU. This is not about figures this is about a combination of popular perception of immigration combined with alienating (parts of) the general public from traditional politics. Immigration is as well very volatile and difficult to predict. Depends heavily on viability of other immigration alternatives as well as the situation in traditional and new donor (of immigrants) countries. 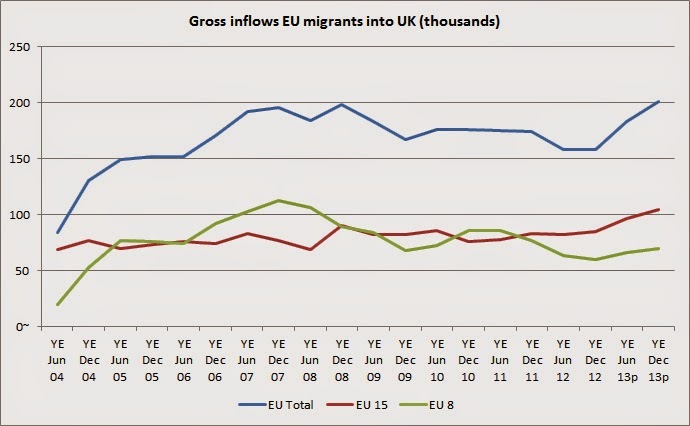 What is already in is often still part of the immigration problem not only the new inflow. This should be the basis of managing this issue. In any case, it seems that the Poles are having none of it. I recall when the Tory party claimed that EU enlargement would be good because the Poles and others in eastern Europe would be their natural allies.